Need Help Entering USA from Canada? 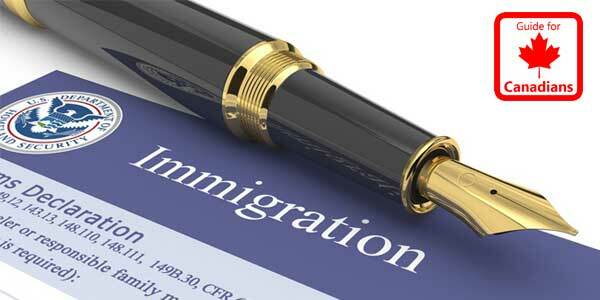 Experienced US immigration lawyer in Canada providing US Waiver services to all Canadians. We are pleased to offer free comprehensive consultations! The US Entry Waiver Application Form is the Department of Homeland Security U.S. Citizenship and Immigration Services (USCIS) Form I-192. Titled "The Application for Advanced Permission to Enter As Nonimmigrant," Form I-192 allows Canadians to apply for advanced permission to visit the United States temporarily. Attempting to complete the United States Entry Waiver I-192 Form on your own could be compared to representing yourself in court; you are entitled to do it, but it might end up being a disastrous decision. Our Canada-based US Immigration Lawyer has considerable experience helping Canadians apply for a US Waiver via Form I-192. Phone us today for a free consultation! If you are inadmissible to the United States because of a criminal conviction, your application must include a statement specifying the name of the crime, date and place of the crime, date and place of conviction (name of court), and the sentence received (including all related judgements). You must sign this information under penalty of perjury under United States law. Proof of citizenship & identity: passport, birth certificate, citizenship card (with photo), naturalization certificate, etc. Evidence of any legal name changes: marriage certificates, divorce decrees, etc. All court dispositions and documents relating to commutation of sentence, probation, pardon, or parole. This is where a lawyer really comes in handy because a US immigration attorney who concentrates on US Waivers will have an expert understanding of exactly which additional documents could best strengthen a given US Entry Waiver application. The CBP website explicitly mentions two documents that are recommended for inclusion in your US Travel Waiver application but not required. The first is a copy of any previously issued I-192 decisions whether or not they were favorable. The second is evidence or written accounts demonstrating either character reformation or rehabilitation related to your reason for non-admission. Information about targeted counseling, volunteer community service, or attending rehabilitation programs such as alcoholics anonymous (AA), narcotics anonymous (NA) or anger management can really help convince US immigration officials that you have changed your life for the better and do not present a threat to American society if they let you into the country. Depending on the reason for denial, there are also a number of other documents such as professional and character references that can help enhance a person's US Entry Waiver application. The Government filing fee is $585 USD, and can only be paid by cheque or money order drawn from a financial institution located in the United States and payable in US currency. The cheque or money order must also be made payable to "U.S. Department of Homeland Security", not "USDHS" or "DHS." Most Canadians find this payment method exceedingly difficult to comply with since they do not have a bank account with an American bank. If you retain the services of a USA Immigration lawyer in Canada you can easily pay this fee directly to the attorney with credit card and then not worry about it again. Please note: US Criminal Waiver fees may be subject to an increase in 2019 or 2020. If you have all the required documents in your possession, the I 192 application can be filed with the U.S. Customs and Border Protection (CBP) in advance of your intended entry date. This can be done at a designated CBP port of entry or preclearance office, and if you are applying in-person, you can even get the fingerprints out of the way at the same time. A USA Immigration Lawyer in Canada can prepare your entire application including writing a persuasive narrative on why you should be admitted into the US. Not only can a legal professional ensure your application is completed properly and makes as strong a case possible for you to be issued a Waiver of Inadmissibility, they can also help you obtain supporting documentation to further strengthen your application. A US immigration lawyer with expertise in US Entry Waivers has been through the process many times before and can help guide their clients through the sometimes confusing process from locating RCMP accredited fingerprinting services to knowing which Ports of Entry (POE) have a history of denying Parole applicants. Attempting to cross the border on your own when you have a criminal record can be stressful, but having an experienced attorney working on your case can make the experience much less mentally taxing. A United States immigration attorney can also help Canadians obtain a US Waiver renewal (I-194) if they have an expiring or expired permit. Does The US I-192 Form Overcome Lack of Ties to Canada? If you have been denied entry to the United States because of lack of ties to Canada, chances are you will not need to complete the I192 Form unless you have a criminal history or an immigration violation on your record such as an overstay. Individuals that have been refused entry at the border due to lack of ties to Canada do not have to "overcome an inadmissibility", they simply have to be able to present better documents to the border proving that they will only be visiting the U.S. temporarily. What Crimes Does Filing an I-192 Waiver Overcome? The I-192 Application Form is issued by the US DHS and allows a foreign national (alien) to enter the United States with a criminal record that includes a moral turpitude crime. Canadians can be denied entry to USA for a variety of crimes including possession of marijuana, possession of cocaine, possession of a controlled substance without a prescription, assault, stealing (major theft as well as minor shoplifting), selling drugs illegally, and fraud. Travelling south of the border with a criminal record that includes one of these offenses is often not possible without filing the USA I-192 Form to get official permission for entry. The I-192 US Waiver application process includes getting fingerprints in order to obtain your RCMP record (Form C-216C). There are many RCMP approved fingerprinting services across Canada, and our US Entry Waiver team can help you find an affordable one in your city. I Have a Canadian Pardon, is an I-192 Waiver Still Required? Yes. Although a Canadian Record Suspension, previously known as a Pardon, will result in a criminal record check coming back as "no record found," it is not recognized by the American government and will not allow you to travel south of the border again. Canada and the United States share criminal databases, and even though a Pardon seals your record in Canada, the US does not erase their copy allowing the border to potentially still see it and refuse you entry. In other words, a Canada Pardon has no effect on a person's admissibility to the US, and the only way to overcome criminal inadmissibility to the country is with a USA Waiver (USCIS I-192). Questions about USA I-192 Waiver Application Form? Call us now to discuss! If you have any criminal history and need to enter the United States, call us now or fill out this form! 24 Hour Response Time! © 2019 Pilkington Law Firm - US Entry Waiver Service. All rights reserved.